I finished these pillows and paintings in March, but I wasn't a blogger then so I'm going to post them now. I suppose it's better this way because Mom visited in the meantime and bought me the cutest (and most greatly needed) bedside lamps and the most darling little suitcase. The two brown fabrics were both purchased at Walmart for a dollar a yard. You have to wait a while, but you can find the cutest things in their bargain fabrics! Just keep checking. I love looking at your blog! You are so creative and make such cute stuff. See, I try to make cute stuff imagining that they'll turn out like that, but they usually don't. How in the world do you make the ruffly-things on the pillows? 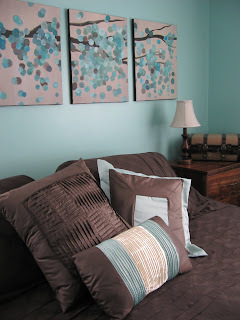 Your paintings and pillows look like they came from pottery barn, seriously. Good job!